Income inequality is not just the topic of the day for governments: Piketty should have written a chapter about the ATP tour. 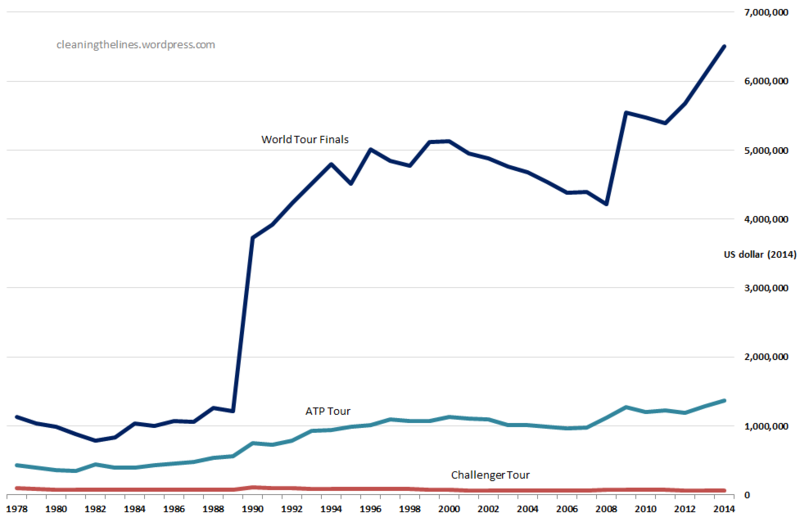 The facts are these: adjusted for inflation, the average prize money for an ATP tour level tournament has increased by over 200% since 1978; and prize money for the World Tour Finals (or equivalent events) has risen by over 400%. At the same time, Challenger level pay has DECREASED by 29%, which is startling when viewed in dollar amounts. The top players have driven the commercial success of the sport, no question, and deserve their share of that. But the current prize money structure also makes it harder to break through into the top 50 and more should be done to look after the next generation which will, after all, sustain the tour through the next 10 years. The good news? Just USD 3.4m will fix part of the problem. The average prize money in 2013 for a Challenger level event (the ATP tour’s second tier) was a shade under USD 65,000. Adjusting for inflation, the same level of event in 1978 had average prize money of USD 94,000. 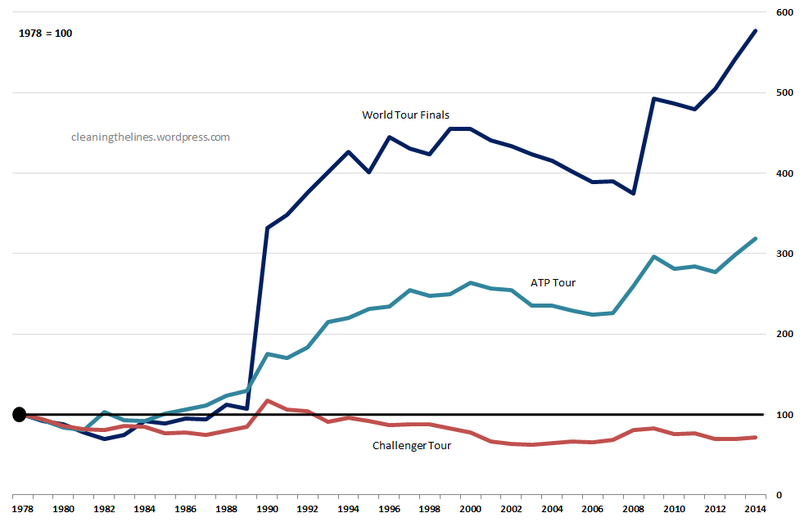 In case you wondered whether this was an historic phenomenon, consider this: the majority of the inflation-adjusted drop in Challenger tournament prize money took place in the 1990s. Here’s what that the same chart looks like, not as percentage change (as above), but in actual change in dollar prize money. This is where my jaw hit the floor. There are two issues here: the inequality itself and what it means for breaking through on tour. The first question to answer is whether the growing inequality in prize money is justified. In 1978 the ratio of prize money for a World Tour Final event compared to a Challenger tour level event was 12:1. By 1990, that had grown to 34:1 and to 94:1 in 2013; all of which recalls the increase in the US economy of CEO-to-worker compensation over the same period (see this EPI paper). And yet, the skew in prize money may now have a different principal objective beyond rewarding players. For example, the winner of the US Open this year will pocket USD 3m, an increase of USD 0.4m. This keeps the prize money of the US Open winner on a par with the Wimbledon champion but is likely to be more important for how the USTA can market the US Open (the “largest purse in tournament history”) than it is for the eventual winner of the title. I doubt Nadal considers he deserves a higher pay cheque this year than last. It’s also worth noting that with the exception of the Runner-up at this year’s US Open every round has a higher percentage increase in prize money than those knocked out in the first round (in notable contrast to Wimbledon). If I’m a member of the Association of Tennis Professionals, and I generally play Challenger tour level events, I would want my Association to look after me a bit more. But aside from inequality, the broader point is this: the prize money structure over the last 30 years has played its part in making it more difficult to break through onto the ATP tour. The ATP tour top 50 is older than ever before and less likely to change. Several reasons have been put forward for this notably the increased fitness, conditioning and athleticism of players. As a result, breaking through, as Patrick Mouratoglou has said, requires more than just technical ability: “Talent [alone] does not always allow people to win.” 17-year-old Alexander Zverev and 19-year-old Nick Kygrios are the exceptions on the tour, unlike 25 years ago. Top players, like Andy Murray, will have a “battalion of experts”, including for example a coach, a physiotherapist, fitness trainer(s), a nutritionist, not to mention a hitting partner. Top players’ prize money and sponsorship money make this affordable for them. Unfortunately, hiring a tennis SWAT team would bankrupt the vast majority of pros. At most tournaments, Russell must adopt a bootstrapper’s mentality: finding the best hotel deals, sharing an on-site masseuse with other players, working frequent flyer miles and other perks, and so on. Some players who make the top 200 will not progress further for want of talent or application or physical ability. Unfortunately, at the moment, financial constraints means finding out is being taken away from some of those players. Here’s the thing: it costs only a little to make the prize money situation a little better. To make Challenger tour prize money in 2014 equal to what it was in 1978 (adjusted for inflation) would cost only USD 3.4 million. That much at least is affordable: US Open 2014 men’s singles prize money alone increased this year by USD 1.7 million. An extra USD 15 million would result in the doubling of Challenger tour prize money since 1978. That may be a stretch in one go, but it’s a tangible outcome of a specific amount. Below, the first chart, showing what could be achieved with different cash injections. 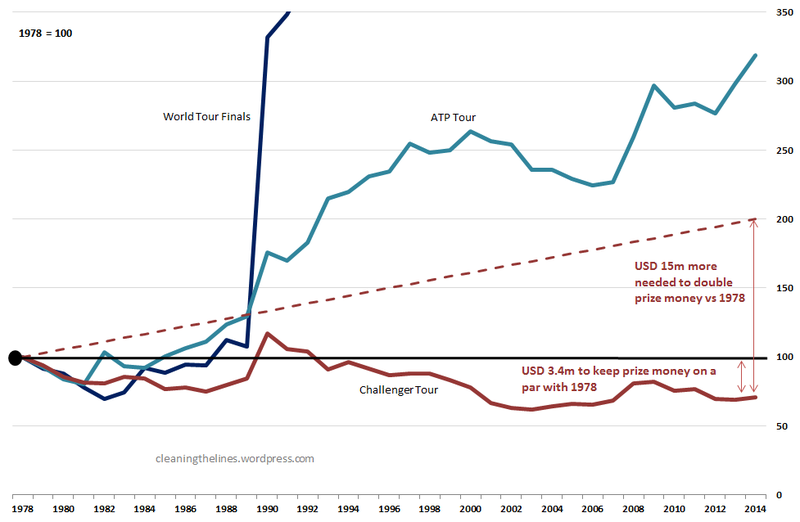 The increase in prize money over the last 30 years is evidence if nothing else that tennis is in good shape. But it needs to invest in its second tier and its next generation – and right now, this isn’t happening enough. All prize money data comes from the ATP World Tour website’s Results Archive pages. I sorted the data by year, and where necessary converted prize money totals quote in euros to US dollars (using annual average exchange rates for each year). In order to adjust for inflation over the years I have used the US government’s CPI index from December each year. I’m not sure if the results archive is accurate with regards to prize money for each tournament on the ATP website…but I was looking back at Daniel Nestor’s singles career and his prize earnings really shocked me. In 1994, Nestor was ranked 140-200 most of the year playing a lot of challengers. 20 years later some of the same exact challengers pay out $520,$860 and around $1,500 for a 1st, 2nd and quarter finals loss respectively. And only $100,000 super challengers pay out $5,000 for a semi-finals performance. Your average $50,000k challenger will pay $2,500 for a semi-finals birth.